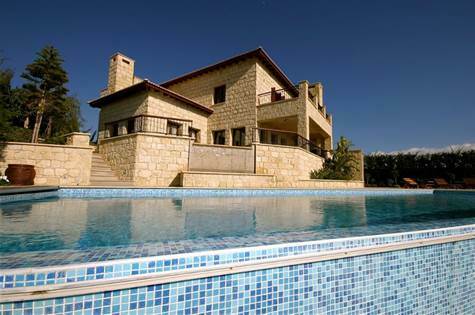 Aphrodite Hills, Paphos, Cyprus - Located at the top of Aphrodite Hills Resort and nestled into a corner plot, just 15 minutes from Paphos town, this luxury villa has the most fabulous, panoramic views across the golf course to the Mediterranean Sea. The fantastic 18-hole golf course is mintes away. The spa and restuarants of Aphrodite Hills are also nearby as are the beaches of Pissouri. Limassol is only 25 minutes away and the newly built American Academy School is less than 10 minutes away. Everything you need or want is close at hand.